I have seen several cases recently where my clients’ computers are unable to access the Internet (Windows updates, AV updates, websites, etc.) even though the computer has a network connection. Additionally, when trying to visit any website, Internet Explore would redirect to http:/// and display a “address is not valid” error. Fortunately, the solution in all of these cases was rather simple. The follow is not guaranteed to solve all Internet connectivity problems. There are many, many reasons you may not be able to access websites: firewalls, malware, damaged hardware, etc. 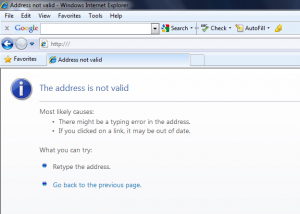 The solution here seems to work in most cases where Internet Explorer (or your browser of choice) is giving you the “address is not valid” error message for ALL websites you attempt to visit. Open up Internet Explorer (even if you normally use a different browser). 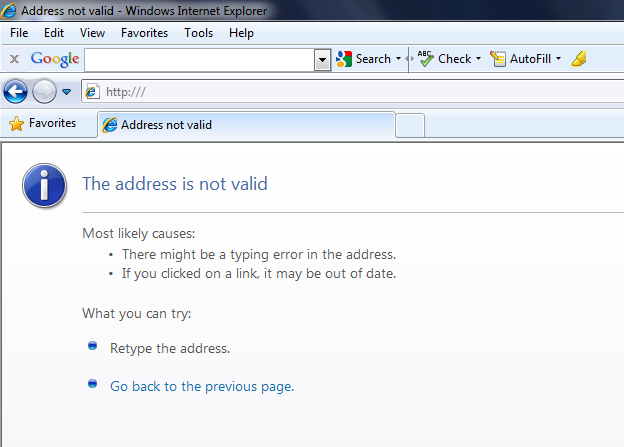 Attempt to navigate to a website to verify you get the “address is not valid” error and a URL redirection to http:/// as shown above. Click “Tools” -> “Internet Options” on the menu bar. If you are using IE 8 or above, you may need to hold down the “Alt” key to see the menu bar. In the window that opens, click the “Connections” tab. Uncheck everything in the window that opens EXCEPT “Automatically detect settings”. “OK” out of all the windows. Close and then re-open Internet Explorer. Everything should now work. If not, your problem lies elsewhere. Should I Use USB Or Ethernet to Connect My Cable Modem? Worked for me. Thank you, thank you, thank you!